Most of the girls definitely know them very well: Draculaura – daughter of Dracula, Frankie Stein and her puppy Watzit, Deuce Gorgon and his cute girlfriend Cleo de Nile. Moreover, you can find Lagoona Blue, Luna Mothews, Clawdeen Wolf, the Mummy, Phantom of the Opera and many more. Maybe a little bit scary but actually friendly children of famous monsters from all over the world. 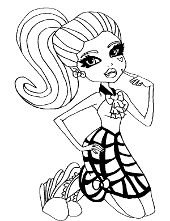 This is the coolest selection of Monster high coloring pictures! Remember to solve our creepy quiz and read all the shocking facts about monsters. Due to Monster High’s big popularity, was created a book to teach English. But instead of traditional characters in a book appeared ghosts and vampires. Worldwide was sold around 100 million Monster High dolls. That’s twice as many as Poland has residents. Clawdeen Wolf (you’ll find her in our coloring books), one of the most popular monsters, at first was about to be called Howleen Wolf but later producers changed their mind. Monster High toys slogan is „Be yourself, be unique, be a monster” that teaches children to accept themselves, to express their individuality and to feel comfortable in their own environment. The producer of these unique dolls is also a manufacturer of Barbie and Ken i.e. Mattel. As you can see they know what to do in order to fit a children’s taste. You find them scary or rather hilarious? Monster High coloring books present not so scary dolls that awfully need to be colored. Ghost, zombies, mummies, phantoms and other unusual creatures surprisingly beloved by children all around the world. Because maybe they’re not the prettiest beings, but they have good hearts inside. 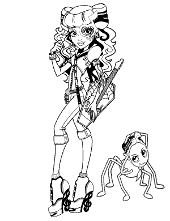 Print out your favorite coloring page and make Monster High world even scarier. Or maybe less if you like them this way. Just look at Sloman Slo Mo Mortavitch, Luna Mothews, Heath Burns Gil Webber, Draculaura, Frankie Stein, Medusa’s very handsome son Deuce Gorgon, Lagoona Blue, Toralei, Clawdeen Wolf, Cleo de Nile – the whole Monster High crew is here! 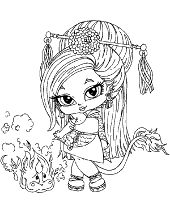 All coloring pages can be printed, even by children, on every home printer for free – A4 paper size.